This is a further update on the convention. Responding to the challenges of our times. By now you should have had Oxana’s poster and hopefully, you have forwarded it onto you various networks, centre members and other people who may be interested in the Convention. It will also be helpful if you can make a few copies and ask people to hand them out or put them in shops, centres, community groups who may be interested in this event. This Convention needs to be seen as a shared project that we can all promote otherwise it will disappear. It’s quite a big undertaken for a group of six, some of whom are still working full-time and others of whom have multiple identities with various duties attached! You will find a registration form on the website so please begin to register. Please note that there is a field that asks if you require food. This is important so as not to waste food – not a sustainable practice nor sensible for an event that runs on a shoestring and voluntary contributions in terms of time, food and other resources. We would like to see it remain that way. In our last update we explained the reason for our choice of topic. 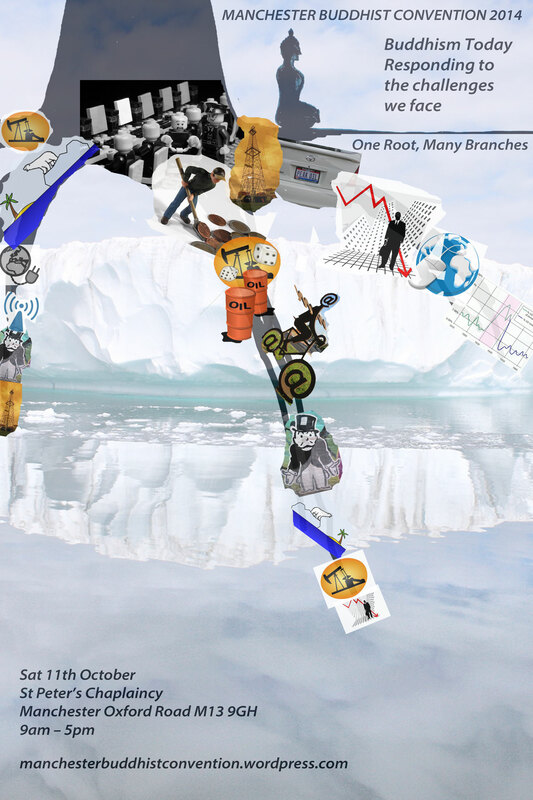 If we stop to consider what is happening to our world, will see that we are beset with problems. This is apparent in the world outside ourselves where we may think we have little control, in our own neighbourhoods as well as within ourselves. This is the scenario. However the aim of the Convention is not to brood on the negativities that surround us and affect us – how can they not? – but to examine them; examine some of the actions that people are taking in response; and come up with ideas that people can take forward. We cannot change our environment entirely but we are not helpless and what we do together can magnify what we do individually or even as different centres.. The Convention will examine some examples of work that is taking place. Through discussion we will try and develop ideas that we can take forward to create healing in different contexts. There are already some ‘new shoots’ that are being examined; people working in different contexts with Buddhist/spiritual ideas. They will be presented at the Convention and participants may have ideas of how to take them forward. There will also be themed discussion spaces for people to explore specific ideas that have come up over the years, or to suggest their own. There are, of course different notions of ‘doing’ among Buddhists. Some think that we have to ‘work on ourselves first’. There are others who believe that we have to do both together; that time is precious and the situation demands it. Sasana is the Sanskrit and Pali term for teaching, spiritual path or practice. I am choosing to use it because the term ‘tradition’ in English is redolent with something that belongs to the past and will not change. There will be one or two more updates in the weeks leading up to the Convention. Please also feel free to post your own material or ideas on the Website – it’s for discussion – but it’s a monologue at the moment. It is a week since the murder of Choji Akong Rinpoche in Chengdu, Tibet, shuddered through the Buddhist community and further. But a week ago, we hadn’t quite got there. It is 6.30 am on Wed 16th Oct, and a grey dawn breaks grudgingly, bringing neither light nor warmth. It settles into a dismal drizzle and the news that first shocked and then settled just below the surface of the mind re-emerges – implacable and inexplicable. Anne Wynn-Wilson the late founder of the Quaker Tapestry made the wonderful suggestion that a Buddhist Embroidery project would be beneficial. 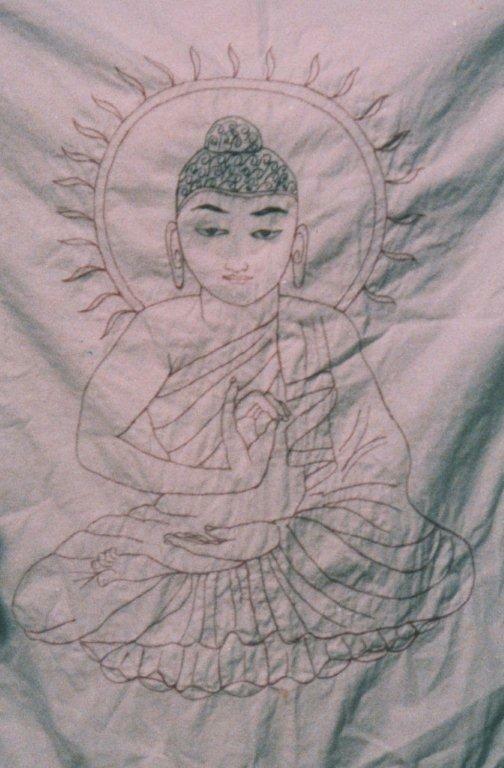 The BEP Buddhist Embroidery Project was started by attendees of the London Buddhist Vihara (Monastery) in 1994. The BEP decided to teach embroidery to people who had not learnt it in childhood. 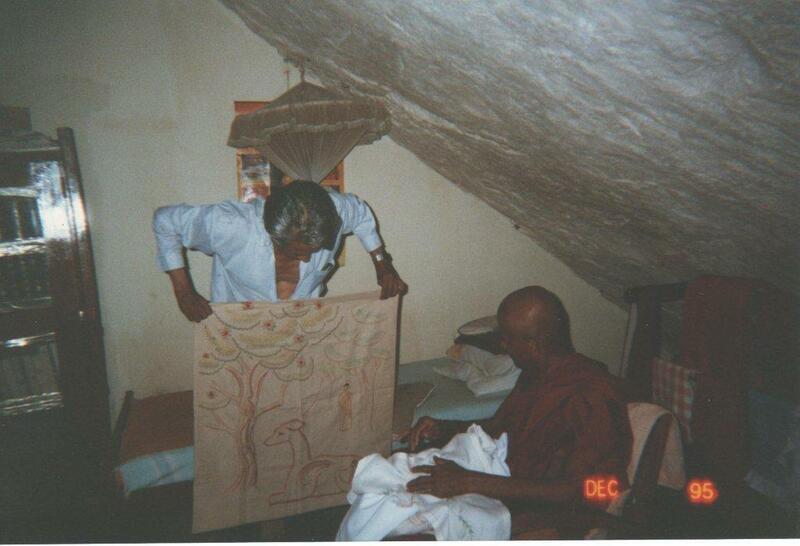 The late Venerable Apparakke Jinaratana, a Theravada Buddhist Bhikkhu (monk), who lived in a cave in Sri Lanka , near a very poor village, was using very old newspapers (supplied by villagers) as tablecloths. The BEP decided to embroider tablecloths, wall hangings and sitting cloths for his use. 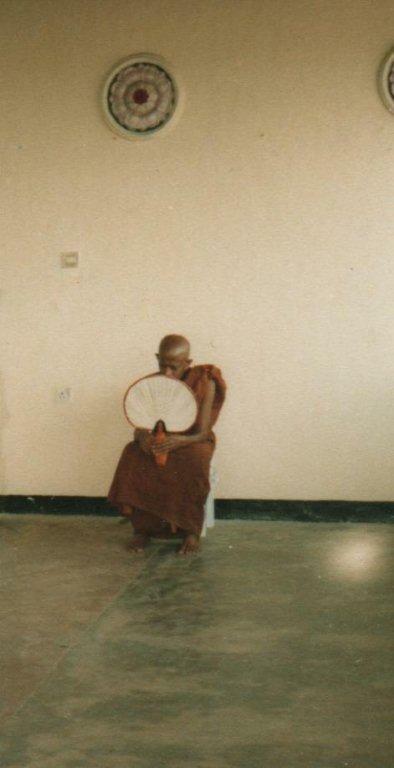 Although items are given to one monk they actually belong to the whole of the Bhikkhu Sangha (Order of Buddhist Monks) according to the Vinaya (Buddhist Monastic Discipline). In Asian villages, washing is done in streams and waterfalls, and hung to dry in the hot sun, so items do not last as long as they do in the west. Materials were donated by Buddhists and Quakers after requests for donations were made in The Friend: The Quaker Weekly, The Devon Vihara [Buddhist Monastery] Newsletter, and The Middle Way: Journal of The Buddhist Society. 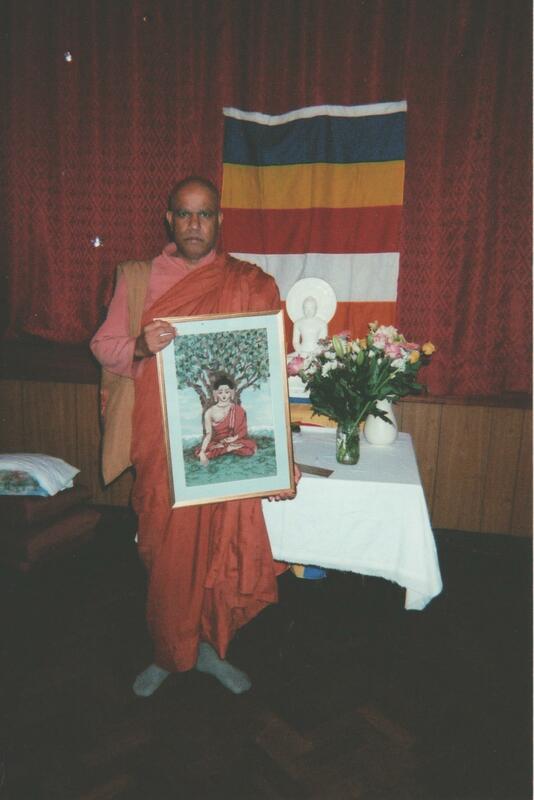 A photograph of the monk receiving the embroideries appeared in The Friend: The Quaker Weekly on 28 June 1996, and the August 1996 issue of The Middle Way: Journal of The Buddhist Society. Bodhicarini Upasika Jayasili Jacquetta Gomes (Secretary BGKT) is a member of the Kendal Unitarian Chapel’s Craft Circle . She embroidered a picture of flowers for the Unitarian Chapel’s Transition Town service on 8th May 2011. This embroidery now hangs in the Unitarian Chapel’s vestry. Vesak celebrations were held at Ketumati Buddhist Vihara Oldham on 14th May 2006. BGKT Buddhist Group of Kendal (Theravada) presented a tapestry of the Buddha (designed and sewn by Fiona Walker of BGKT) to Venerable Piyatissa. 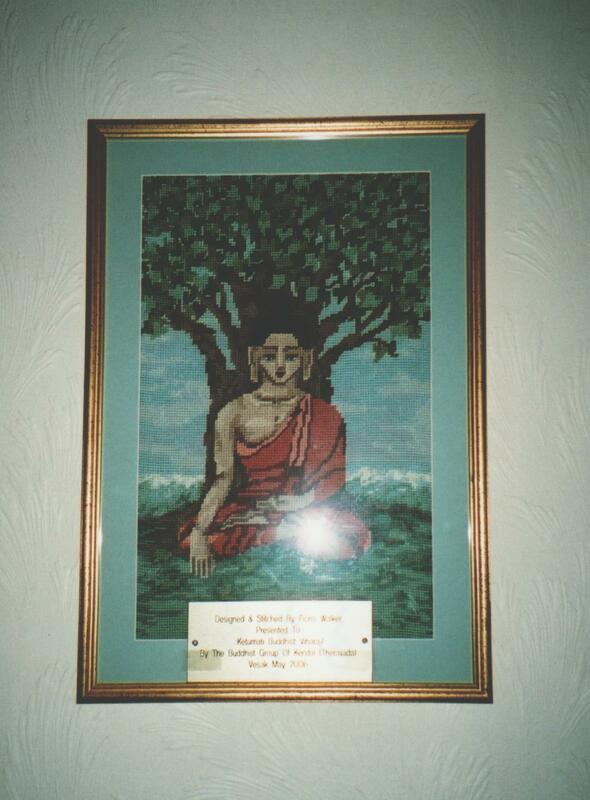 This now hangs in the main hall of Ketumati Buddhist Vihara. 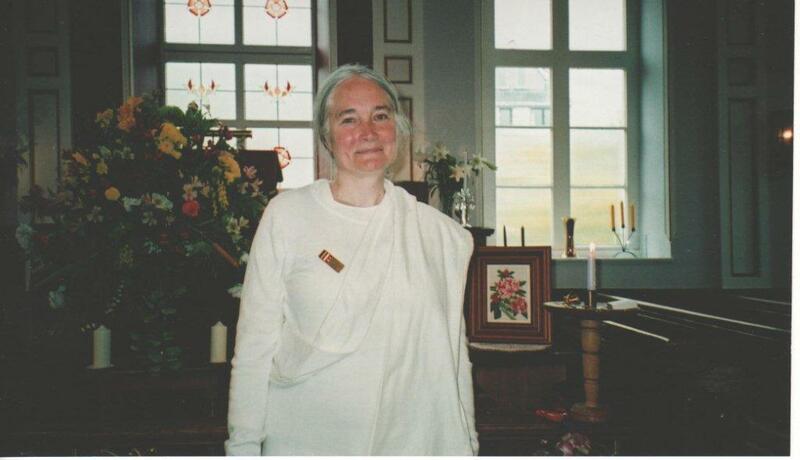 Venerable Pidiville Piyatissa Head of Ketumati Buddhist Vihara Oldham and Jacquetta Gomes Bodhicarini Upasika Jayasili Secretary BGKT Buddhist Group of Kendal (Theravada) will lead a session at the Convention about their work in Kendal. 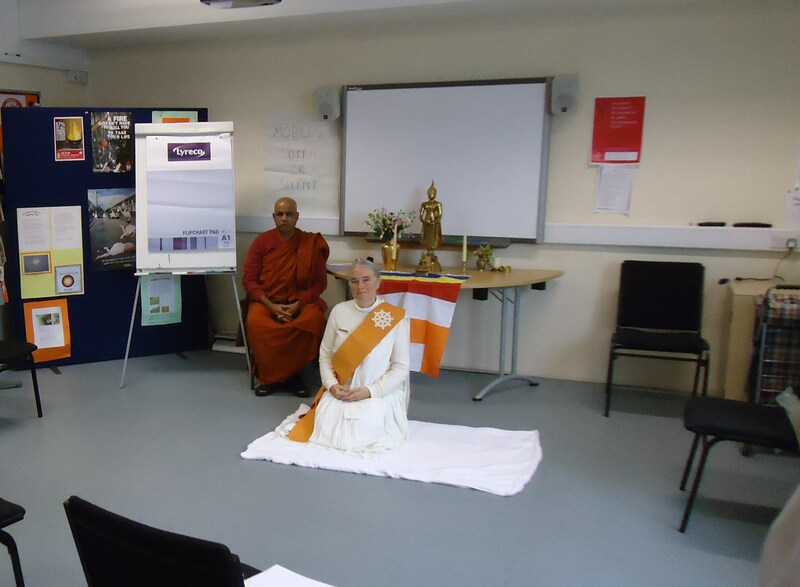 Piyatissa for BGKT.Venerable Pidiville Piyatissa led a retreat for BGKT Buddhist Group of Kendal (Theravada) at Kendal Fire Station community room in 2011. As far as we are aware, this the first retreat led by a Buddhist Monk to take place in a Fire Station in the UK . BGKT Buddhist Group of Kendal (Theravada) Cumbria Fire and Rescue Service are developing a pilot project at Kendal Fire Station with Cumbria Fire and Rescue. This is led by Steve Healey, Will Richardson and Gloria Warwick from the Fire Service and Jacquetta Gomes from BGKT. 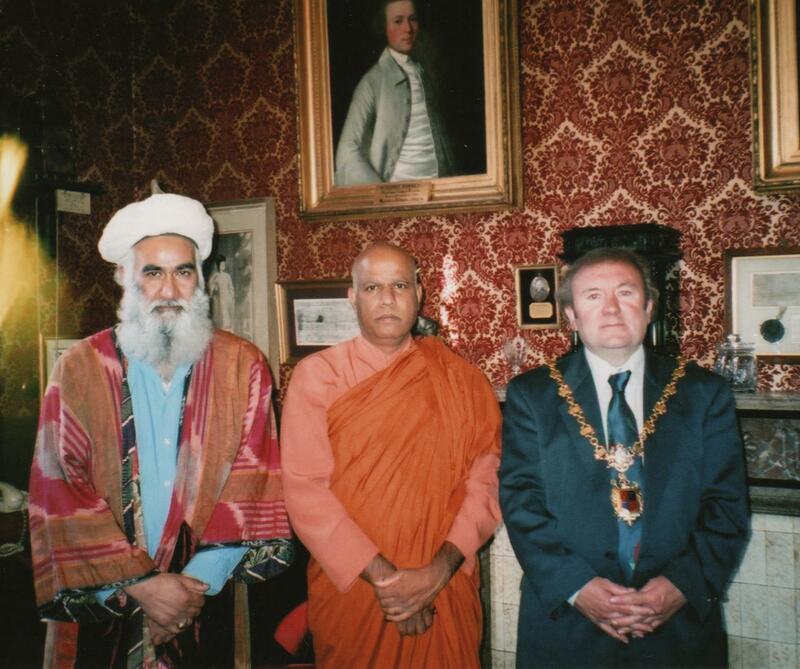 Chief Constable Stuart Hyde is working with local Buddhists and interfaith forums. He hopes that the Police will develop closer links with all faiths and religious organisations present in Cumbria . 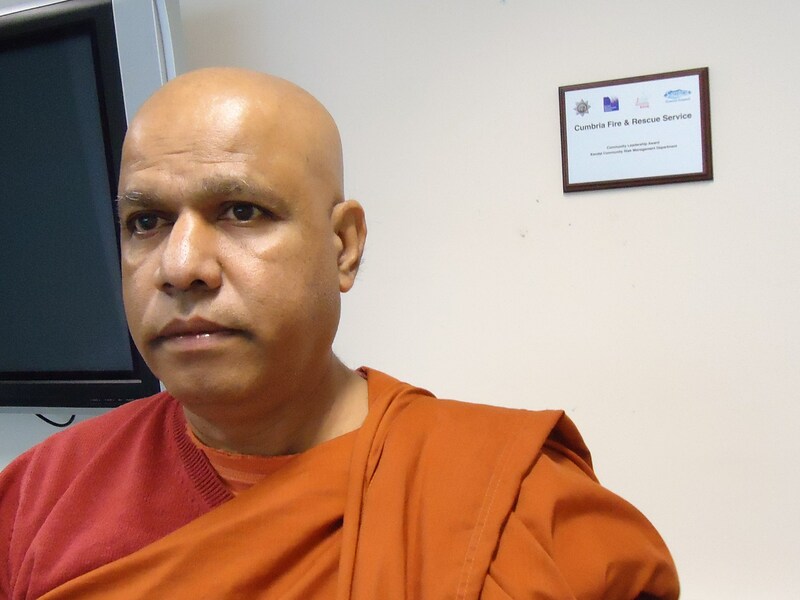 There is an urgent need for Buddhist Chaplaincy provision for major emergencies. Keith Munnings from Kalyana Mitra Buddhist Chaplains is offering his experience in Buddhist and multifaith Chaplaincy to CC Hyde. 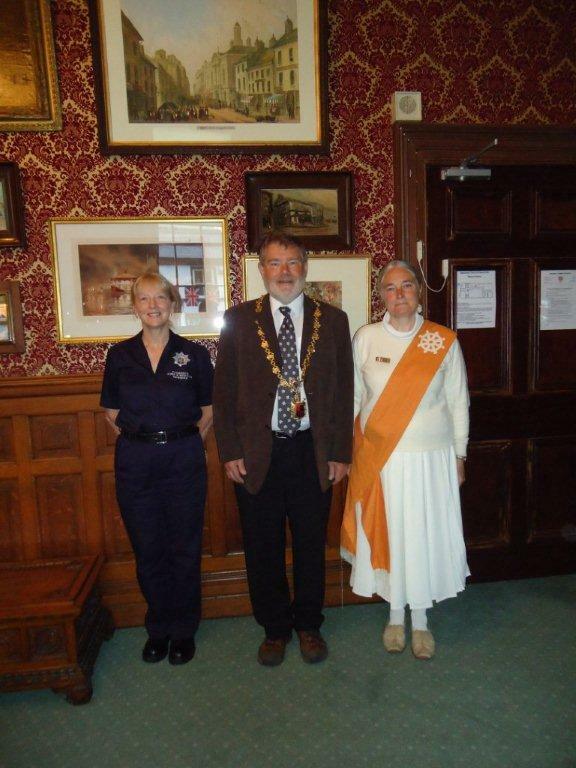 Mayors Parlour Kendal Town Hall 15 September 2009 after meeting for agencies and faith representatives at Kendal Fire Station. 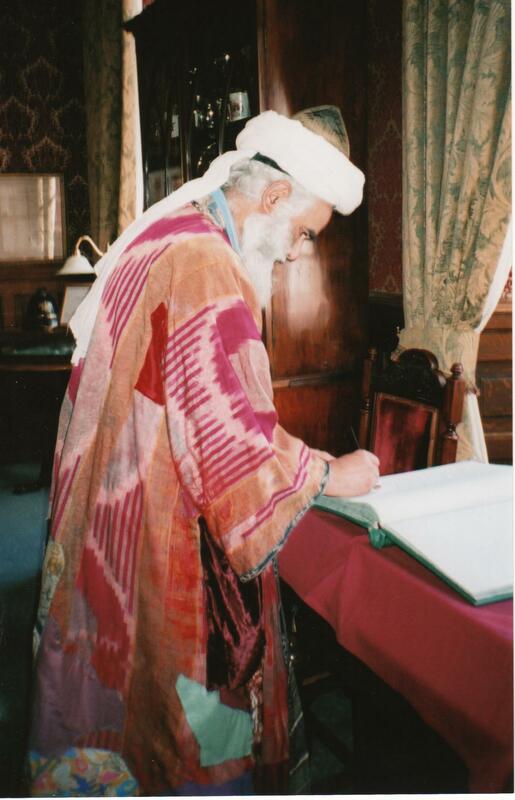 Mayor of Kendal Councillor John Bateson, Islamic Sufi Nuh Nazir, Venerable Pidiville Piyatissa. 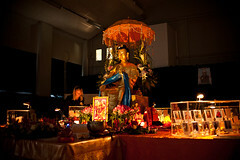 What is Manchester Buddhist Convention? Aim: The MBC aims to increase dialogue and engagement between different Buddhist schools and welcomes other interested people or groups to work together to increase compassion and understanding in our society. Method: The MBC will do this, primarily, by organising an annual event to share Dharma/Dhamma and practice; discuss current issues and possible actions. Manner: The MBC will reflect our commitment by developing an ethical framework based on the five lay precepts with regard to purchasing, banking, transparency and engagement with each other. Enter your email address if you want to receive notifications of new posts on the front page of this website by email. Remember that you can also subscribe to comments to a particular post that interests you. May all merit created by running this website be to the benefit of all sentient beings. 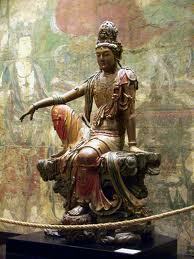 May all sentient beings in the Universe, of the past, present, and future, be well and happy. Views expressed by authors of articles, videos and audios posted on this website are opinions of individuals, not the official position of their respective Buddhist tradition, nor the view of Manchester Buddhist Convention's organisers or participants.